You’ve got itchy feet and you’ve already started a list of places you want to spend a few months exploring after reading part one of our series. So what’s the next step to becoming a digital nomad armed with little more than your laptop and a few choice projects to keep the money rolling in? Here’re the next steps to location-independent lifestyle. With a bit more research and planning you’ll be able to avoid the common pitfalls and be packing your case in no time. By making some prudent choices up front, you’ll ensure your trip is successful, productive and a life-changing experience. This is your eleven-step plan to location-independent living. Take care of the details now and you’ll reap the rewards on your trip! Focus on each point below; plan it, sort it and your three month trip will be one of the best times of your life. Chiang Mai, Thailand is one of the top rated freelance locations for its fast Internet speed and low costs of living. Reliable internet access and mobile coverage is a must when you work remotely, so choose your location with care to ensure that you aren’t hampered by poor connectivity. You can get a Skype phone number (UK call charges apply for your clients) that you can use worldwide for £35 per year. That way, you can make and receive calls wherever you are providing that you have a Wifi connection. Reliable internet access is a must for most freelancers; if you rely on sending data, working on remote and virtual systems and need access to bill and communicate. Think about the connections available within your accommodation package or workspace. Some locations are notoriously bad for internet connections. Plus don’t rely on sitting in cafes and bars; choosing the right workspace or accommodation that includes Wifi access is more reliable and you’re more likely to be productive in a supportive work environment. Planning an extended stay that blends work and leisure brings different challenges in terms of budget and accommodation requirements. You can opt to book via standard channels using hotel rooms and self-catering accommodation, but there’s a growing market in finding long-term accommodation to suite a variety of budgets. www.airbnb.co.uk is a prime example. It’s a website crammed with great value places to stay all over the world where you can rent apartments, rooms and more perfect for the working traveller. There are also lots of hostel booking websites like www.hostelworld.com and www.hostelbookers.com for those on a tighter budget. Think about your budget and what you want from your accommodation. Space and quiet to rest, recharge and work are all factors to think about. Having accommodation that allows you to work productively means you can work at more flexible times, have a zero commute and saves you transporting your valuable work equipment somewhere else to work. You can choose living accommodation that allows you to work comfortably without leaving where you stay. This is a great choice if you like your own space, want to limit distractions and want to be able to set up a ‘base camp’. Ensure the accommodation fits your need for connectivity, work space requirements and working environment. If you prefer to keep your living space and workspace separate, then a shared workspace may be more suitable. There are plenty websites and communities that provide access to co-working spaces where you can book a desk. This works well if you like to work with others and prefer an office environment. Office space costs vary considerably, so do your homework and compare a few sites for your chosen destination. Buenos Aires is another affordable, easily accessible and multi-cultural destination for freelancers. You’d be fascinated to find out that locals are very sociable and like speaking to strangers. This is closely linked to connectivity. Look at how you communicate with your clients. A reliable internet connection is a must, as is telephone access. If the majority of your work is conducted over the web and by email, then you might want to invest in a Skype phone number. It gives you a UK based number for clients to call, that ensures you can keep in touch wherever you have an internet connection for £35 per year. Or you could look at purchasing a SIM to use while you are away. Check the costs and packages available for internet access and telephony so you get the best deal for your specific needs. Another core area worth planning for is the time difference between where you are and your UK-based clients. A time difference can work to your advantage, giving you the freedom to work uninterrupted while your clients are asleep on the other side of the world. The key to making it work is to ensure that your clients know when and how they can contact you, plus ensure that you update them regularly as you would if you were here in the UK. Make sure that any post in the UK is handled properly while you are away. A trusted person could open your mail and send it on if needed (scanning it in and emailing it is a great way to do this), or you can use a company such as www.scanmypost.co.uk that offers this service. Skype – voice and video calls via the web and phone apps. Dropbox and Google Drive –cloud-based sharing and storing files. Basecamp – an online collaboration tool. Teamviewer – an app that allows multiple users to see screens at the same time. Weekplan.net – a weekly planner recommended by S. Covey in his world famous book “Seven Habits of Highly Effective People” that can help you keep on track of your tasks. Find out even more useful apps in our guide to Business essentials for your new company. 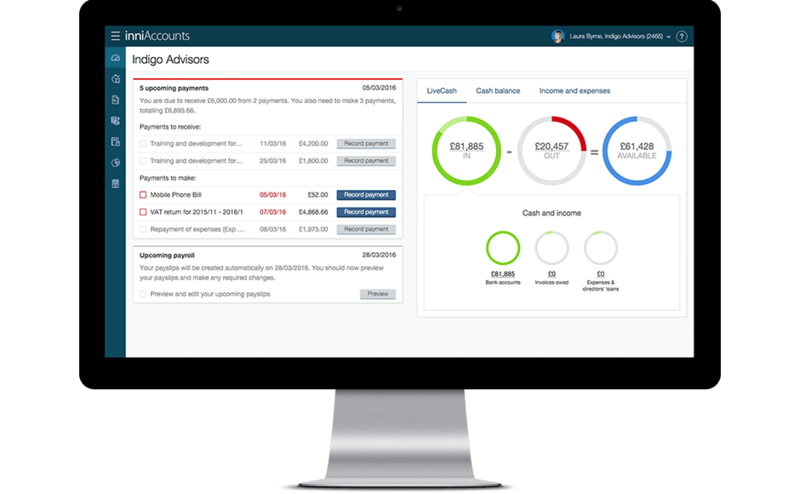 Online banking (for your company and your personal finances). Company accounting – either manually via a spreadsheet or through an online app from your accountant. Think about how you’ll handle invoicing, bill payments, cost and income tracking and paying yourself. If you’re an inniAccounts customer, all this is taken care of via our online app. Back up important documents and resources – look at ensuring you have multiple copies of valuable documents and arrangements. Share them with close family/friends or colleagues as well as in cloud-based storage. That way, should the worst happen, you will always be able to access your insurance, visa, healthcare and other important travel documents wherever you are with a couple of phone calls. Back up files and work – power outage, lost laptops, mishaps. If you backup your files regularly, you’ll be able to pick up where you left off quickly and efficiently. Storing work in the Cloud as well as having a physical backup or sent to a trusted repository via email can provide a great safety net if anything happens to your core workspace and tools. Have a backup plan – plan for the worst and hope for the best. By having access to a slush fund, ensuring that you have the right level of insurance cover for your trip, and plus having a good list of emergency contacts stored in your phone, as well as a physical list in your accommodation and elsewhere is a great way to ensure that if anything happens, the right people can be notified and help you get back on your feet as quickly as possible. It doesn’t need to be a catastrophic event to throw a spanner in the works. Losing your bank cards is enough to disrupt and cause problems. By having contact numbers and adequate cover to hand you minimise the disruption. It can be tempting to leave some of your travel plans until you get there, but booking everything in advance clears your time to soak up the atmosphere or do some work en-route. By organising as much as you can from the UK, you can ensure that it’s all taken care of before you go as well as budget more effectively. Think of your trip as a long-term stay rather than a back-packing adventure. If it’s your first time combining travel with work, it’s best to keep things simple. Stay in a fantastic location, work to plan and enjoy all that your location has to offer. By staying in one place, you’ll be more settled, fall into a routine so you can be productive when you need to be and really get to know the place. Medellin has earned its reputation for a preferred digital nomads location in the recent years for its culture, food and attractive prices. By being self-disciplined you can ensure that you get the work done that is required and leave plenty time for fun. By planning your trip effectively; choosing off-peak times to avoid the rush, timing it to coincide with festivals, key dates or other events you can ensure that you maximise your stay in terms of experiences when you are there. Go when the weather suits and ensure that your workspace is comfortable and you still get to take advantage of the weather in your free time. Minimise distractions where you rest and work – a hostel may be a great place to stay on a budget, but will it provide the best base for a working trip? “Friends and good manners will carry you where money won’t go.” – Margaret Walker. Observing local customs and etiquette will get you further than anything else you take with you on your travels. By doing your homework before you go, you can dress appropriately, observe local customs and smooth the way to the best service and treatment while you are there. Having a basic understanding of the local language and customs is by far the best way to get the best welcome wherever you travel. Insure – yourself and your belongings for the trip. Plus look at the conditions of your home and business insurance to ensure that you have adequate cover. Protect – check what vaccinations you need for your travels as well as looking at what precautions you need to take in the area (both medical and physical). Communicate – grab a phrase book and a dictionary so that you have the basics covered before you go. That way, you can ask for help when you need it. Pack light and keep all your important belongings with you as hand luggage. Think about taking the bare minimum with you and you could look at sending additional clothing and supplies via a trusted logistics company. A favourite with bikers, this is a great way of travelling light and having everything you need. Travelling and freelancing can be the most rewarding experience of your life. By being organised, you can have the work-life balance and see all the places you’ve ever dreamed of. Aim high, plan meticulously, work hard and you’ll reap the rewards! Get in touch and find out how to manage your company finances from wherever your travels take you.